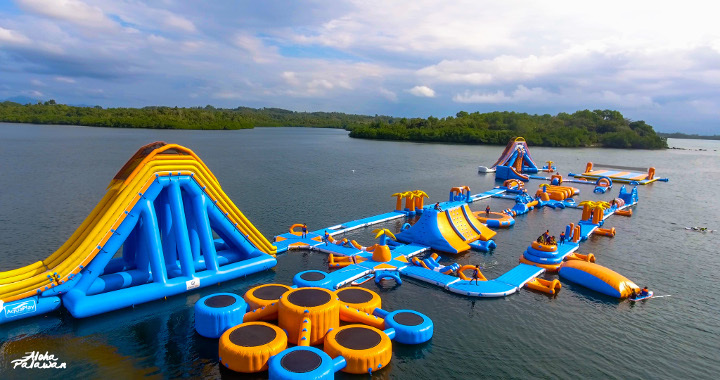 Palawan’s first aqua park and the biggest one in Asia is now at Kamia Bay Resort! Island Adventure is almost four thousand sqm of inflatable fun perfect for all ages. The various elements of the playground include two slides of almost 40 feet high, mini slides, different obstacles, wall climbing, a human launcher, and many more! Experiencing Kamia Bay Island Adventure is like being in a fun Japanese show where you slip, slide, and fall over multiple times. You’d look funny but that’s the whole point! You don’t have to be afraid of being hurt because you land directly in water with your life vest floating for you. Life guards and the staff at Kamia Bay also hold a safety briefing for all.